This hotel is 100PCT Non-smoking. 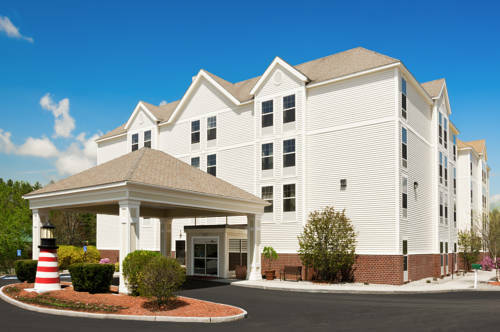 The Hampton Inn Waterville hotel is conveniently located off Interstate 95 at Exit 127 /formerly Exit 33/ just 20 minutes north of Augusta the State Capitol of Maine. Whether it*s a hike in the mountains fishing in the beautiful Belgrade Lakes snowmobiling golfing or cross country skiing Waterville has it all. Area attractions near our Waterville Hampton Inn hotel include the Colby College Art Museum Maine State Museum Waterville Opera House T - B Celebration Banquet Facility Old Fort Western Belgrade Lakes Golf Course and antique shopping. Dining is available nearby at The Weathervane Seafood Restaurant Joseph*s Fireside Steakhouse The Last Unicorn Amici*s Cucina Mainly Brews and Applebee*s. Kick off your shoes and relax in one of the tastefully decorated hotel rooms at our Waterville Hampton Inn offering one king bed or two queen bed rooms. Hotel room features include a coffee maker hair dryer makeup mirror iron and ironing board free WiFi and Lodge Net cable TV with complimentary HBO. Guests can request spacious one and two-room suites that include a microwave and refrigerator. After a long day enjoy the relaxing atmosphere of our indoor heated pool or work off the stresses of the day in the fully-equipped exercise facility. In the morning whether a business or leisure Maine traveler Hampton Inn Waterville hotel guests will enjoy our free On the House hot breakfast buffet daily. Meeting space and audio/visual equipment are available to accommodate up to 65 people. We love having you here in Maine at the Hampton Inn Waterville hotel.